An opportunity missed. A fudge. An unholy mess. Another day, another unpopular tournament structure from the International Cricket Council. They don’t seem to be able to please anyone. Criticised for ponderous World Cup tournaments, told repeatedly that the 1992 was the model tournament, they adopt the 1992 structure for 2019 and are torn to pieces for not extending the competition to include more teams. And now, after several false starts, they have finally launched the World Test Championship. It’s hard to find anyone outside Dubai who will defend it. It’s worth starting by looking at the bigger picture, before focusing on the finer details. Now that the Champions’ Trophy ODI series has been scrapped, there is an opportunity to have a four-yearly World Cup and World Test Championship Final competition alternating with the biannual World T20. However, the ICC has decided that the test match competition will take place on a two-year cycle, between World Cups (think Olympic Games and Commonwealth Games). This leads to a rather untidy overall plan, not least because the ICC has decided to schedule World T20 tournaments in successive years. The purpose of the WTC is to lend context, competition and clarity to test cricket. In the first of these aims, it will by its very existence succeed. Having a league of sorts is more meaningful than a number of bilateral series which are entirely separate from each other. Of course, the Ashes has a historical context which could hardly be improved upon by any stroke of a contemporary scheduler’s pen, and some other series also have a tangible history. The obvious series are the Trans-Tasman Trophy and India v Pakistan, though it has been more than ten years since the latter have met. Australia and South Africa rubbers have acquired a certain relish and piquancy, though not always for cricketing reasons. On the whole, though, the matches have no higher purpose than fulfilling their inherent value of examining players’ abilities in the most difficult form of the game. Whether the WTC turns out to be a meaningful competition remains to be seen. It has the advantage of not replacing an existing tournament, so there will at least be a degree of competition where before there was none. The substantial challenge facing the ICC is how to quantify results given the competition’s two chief statistical difficulties: the varying number of tests in each series, and the fact that certain teams will not play each other. Thus it will not necessarily be obvious to the public, at the outset of a match or series, what impact the result will have on the Championship table. It will quite possibly be necessary for the table to utilise an index – a weighted system of points – rather than allocation of absolute integers. If this turns out to be the method used, the system will have to be demonstrably distinct from – and superior to – the present international test team rankings assigned by David Kendrix’s algorithm. The prima facie evidence strongly suggests that the designers have been prepared from the outset to discard any temptation towards clarity. In an ideal world, the nine countries involved would play each other, home and away, in series of identical length. Three-test series would do the trick; they are neither too long nor too short, and they allow for a deciding match (which the recent two-test series between England and Pakistan sorely missed). 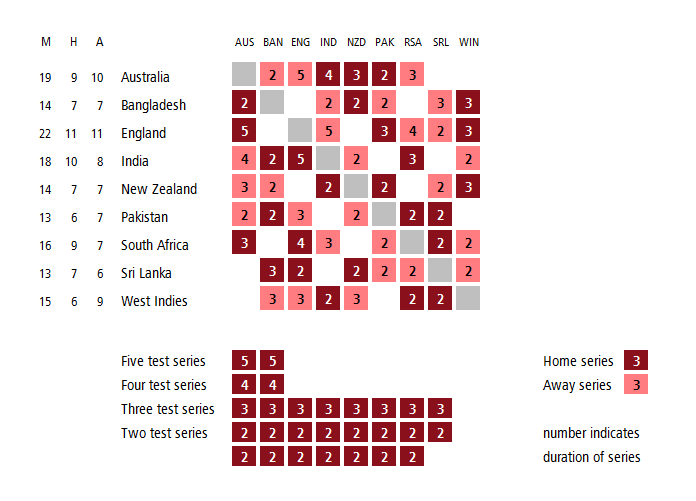 Each test team would therefore play 16 series, and given that the right balance seems to be two series in a home season, the whole competition would be played over four years. England will not host Sri Lanka, and will not play Bangladesh at all. Australia will not host Sri Lanka or Bangladesh, nor visit New Zealand or the West Indies. India will not host West Indies, nor visit Sri Lanka, and will not play Pakistan at all. They will play only six matches in 2020 and not a single one in India. The following year they will play 15 tests. New Zealand will not host Australia, nor visit South Africa or the West Indies. Bangladesh will not host South Africa at home, nor visit Australia, and will not play England at all. They will have tours to Zimbabwe in consecutive years (2021 and 2022). Pakistan will not host the West Indies, nor visit South Africa, and will not play India at all. Sri Lanka will not host South Africa or India, nor visit England or Australia. They will not play any test matches for two years, between July 2020 and July 2022. South Africa will not host Pakistan or New Zealand, nor visit Sri Lanka or Bangladesh. West Indies will not host Australia or New Zealand, nor visit India or Pakistan. From January 2021 to October 2022 they will play four consecutive home series and no away tests at all. In the next three months to December 2022, they will undertake three test tours, to South Africa, Sri Lanka and Australia. The first two-year cycle of the WTC (2019—2021) comprises two five-test series (The 2019 Ashes and India v England), two four-test series (Australia v India and South Africa v England), eight three-test series and 15 two-test series. England will also host New Zealand for a two-test series that doesn’t count towards the Championship. From a spectator’s point of view, it is an absolute mess. From a scheduler’s perspective, it is utter madness. But there is method in it. The competition may be far from the ‘ideal’ format outlined above, but the realities of modern cricket – of test cricket, moreover – effectively rule out any hope of simplicity and legibility. It’s possible that the ICC considers a four-year cycle too long to decide the best team in the world. Squads change, players’ stars rise and fall, teams evolve. The WTC needs to reflect the form of international teams as it is now, not as it was three or four years ago. It’s tempting to say ‘ah, but the World Cup takes place every four years, so why not the World Test Championship?’ But the World Cup is only played over a few weeks; the time between tournaments exists in order to allow teams to change their ways and methods. The WTC needs to reflect the prowess of teams over its entire duration. As much as it would be wonderfully neat and tidy to dictate a uniform length of test series, but to do so would be to impose an unrealistic and arbitrary system on a complex reality. As we all know only too well, test cricket sells in some countries and is more or less obsolete in others. The English adore it, and it suits them to schedule three, four or five-test series knowing that they will be able to sell every seat. In other countries, this just isn’t the case, however much we would like it to be. The ICC’s schedule allows each country to schedule the test cricket it thinks it can sell; a one-size-fits-all tournament may look desirable in the shop window, but if the goods can’t be sold then the product is worthless. We need to remember that the ICC is trying, through the WTC proposals, to keep test cricket alive, to set in stone what remains of it in the countries where it has been in a steep decline. We can’t make India play Pakistan. It would be wonderful it these two proud nations could put their politics aside and play a ‘friendship series’, but the reality of the situation is that the boards and governments involved are not ready for it. You cannot force cricket teams to do things their governments don’t want them to do and, to be honest, why even try? Yes, the schedule is a mess. No, it has parallels in serious other global sporting competition. But had the ICC published this schedule simply as the next four-year cycle of the ‘Future Tours Programme’ then nobody would have batted an eyelid. The fact is that the Future Tours Programme, with its haphazard arrangement of bilateral series, was the only system that the boards could agree on. The ICC’s test team rankings table was considered sufficiently robust to award a ‘Test Championship Mace’ to the highest-ranked team every odd-numbered year. The present WTC proposal is – in essence and in practice – a simple coupling of the FTP and the rankings. Once it gets underway next year, it will feel no different from the present system. Teams will play a series, at the end of which the table will be updated. In 2021, instead of a massive crystal-encrusted sceptre being awarded to the best team, there will be a test match between the top two teams. Ultimately, that’s the only thing that’s changed. The ICC has kept the baby and the bathwater. And it could be worse. Spare a thought for poor Ireland, which has drawn the shortest straw from the scheduler’s hand. After they hosted such an engaging and successful first home test match, they must now wait two whole years for their next home campaign: a solitary test against Bangladesh in June 2020. Excluded from the new schedule, they instead have three tours to Afghanistan – all in the freezing central Asian winter – in the space of 22 months. They must be wondering what they did wrong.